NETWORK FINALS: EMPIRE, THE VOICE and the MODERN FAMILY rerun gained 0.1 in final numbers. CABLE HIGHLIGHTS: The NBA PLAYOFFS had their accustomed place at the top of Wednesday cable, with TNT’s games at 1.48/1.41. On VH1, BLACK INK CREW ticked down to 0.51, and HIP-HOP SQUARES returned at 0.40/0.36. Bravo’s REAL HOUSEWIVES OF NYC gained 0.04 to 0.46, and SELL IT LIKE SERHANT held at 0.12. 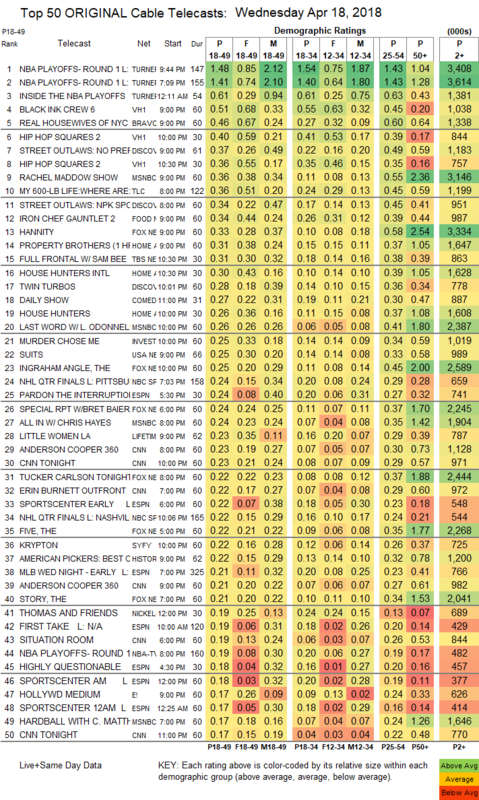 On Discovery, 2 hours of STREET OUTLAWS were at 0.37/0.34, compared to last week’s 0.45/0.41, and TWIN TURBOS was up 0.02 to 0.28. MSNBC’s RACHEL MADDOW SHOW led cable news at 0.36/0.55/3.1M, over Fox News’s HANNITY at 0.33/0.58/3.3M and CNN’s ANDERSON COOPER 360 at 0.23/0.30/1.1M. On TLC, MY 600-LB LIFE dropped 0.04 to 0.36, and SKIN TIGHT was down 0.08 to 0.17. Food Network’s IRON CHEF GAUNTLET ticked up to 0.34. On HGTV, PROPERTY BROTHERS gained a tick to 0.31, HOUSE HUNTERS INTL lost a tick to 0.30, and HOUSE HUNTERS was down 0.09 to 0.26. TBS’s FULL FRONTAL returned at 0.31. Comedy Central’s THE DAILY SHOW made an unusual Top 20 appearance at 0.27. On ID, MURDER CHOSE ME slipped 0.02 to 0.25. USA’s SUITS ticked up to 0.25. NBC Sports Net’s NHL PLAYOFFS games were at 0.24/0.22. Lifetime’s LITTLE WOMEN rose 0.02 to 0.23, and the season finale of GLAM MASTERS was up 0.03 to 0.15. On Syfy, KRYPTON lost 0.03 to 0.22, and THE EXPANSE fell 0.06 to 0.15. 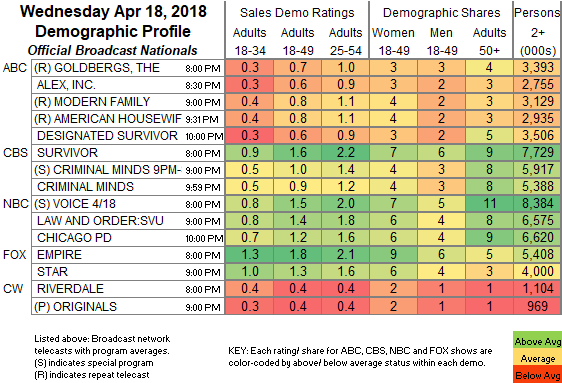 E!’s HOLLYWOOD MEDIUM ticked down to 0.17. MTV’s CATFISH was at 0.17. FX’s THE AMERICANS dropped 0.05 to 0.13. A&E’s FLIP WARS was at 0.10. Freeform’s FAMOUS IN LOVE fell 0.04 to 0.08. POP’s HOLLYWOOD DARLINGS stayed off the chart, down 0.01 to 0.03/141K.